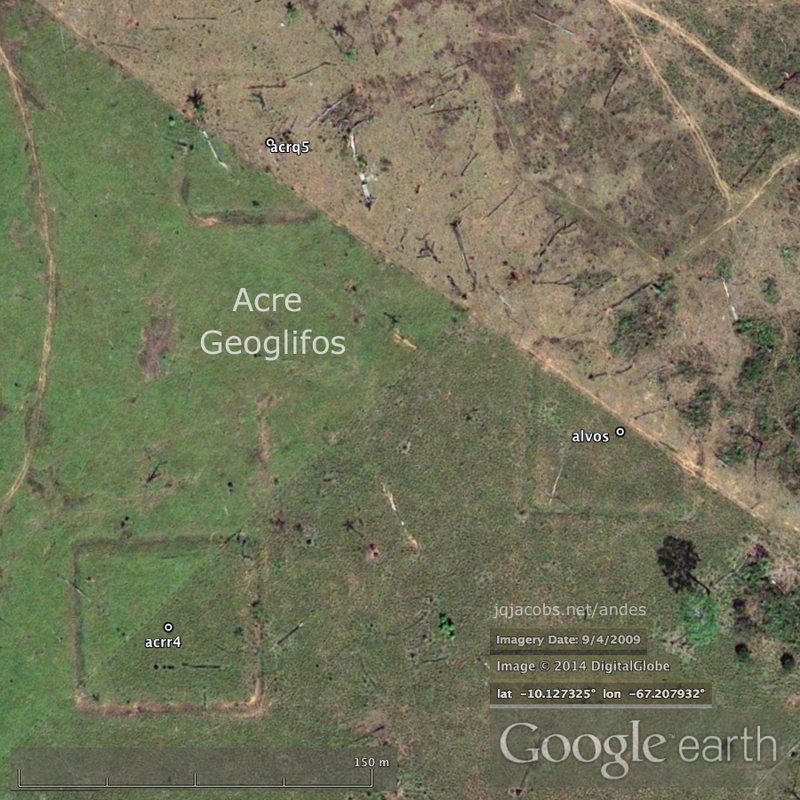 2010.01.20 - Geoglifos is the term applied in Brazil to geometric earthworks discovered after recent deforestation. Geoglyphs are not new in South American archaeology, but these are different—massive earthworks of tropical forest soil rather than desert surface alterations. The Amazon Geoglifos present geometric forms; circles, squares, ellipses, octagons, and more, with individual forms up to several hundred meters across. Some are connected by parallel walls. Their distribution spans hundreds of kilometers, and much of the area remains forested jungle. Some resemble geometric earthworks in the Ohio Valley. Click images to view larger aerial imagery. 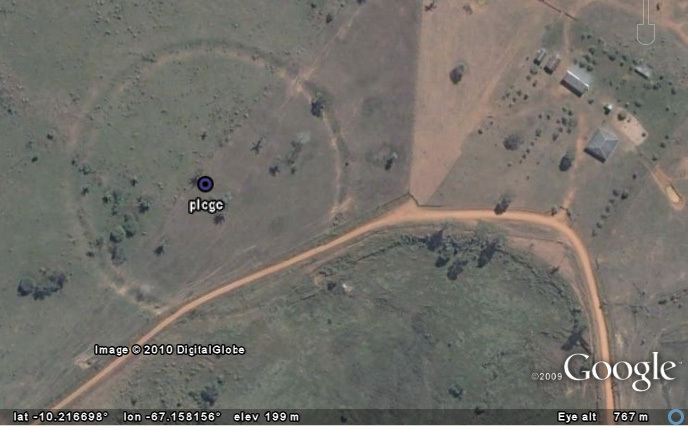 Geoglifos have been discovered in Google Earth by exploring areas with recent high-resolution imagery updates. (Click thumbnail images herein to view larger image files in a new window.) 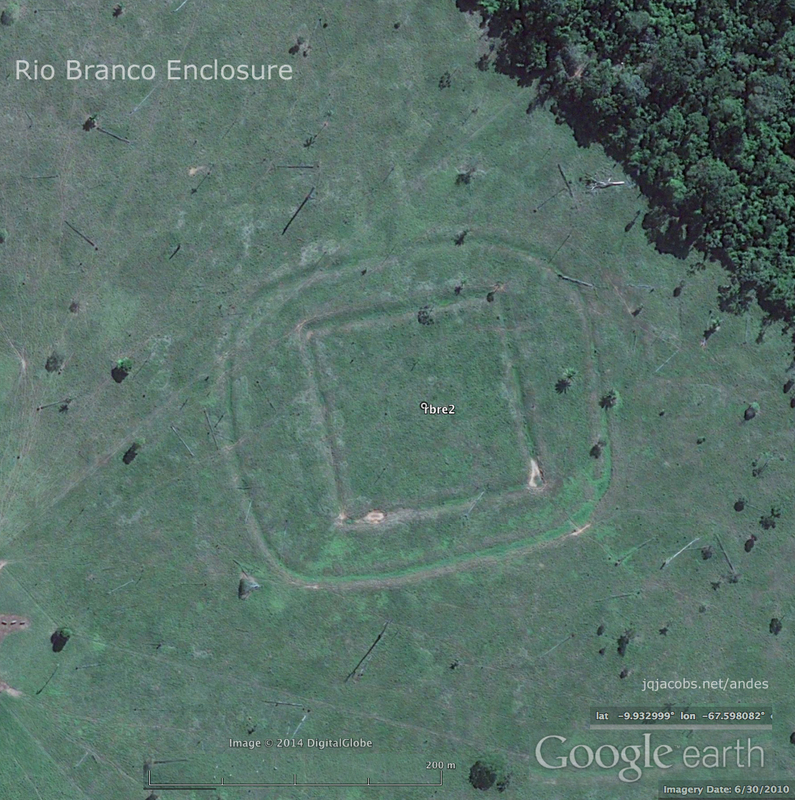 Recent Brazilian news videos on the ground and from small planes, embedded below, clearly illustrate the impressive scale, the massiveness of the amount of earth moved, and the unique monumental quality of this ancient cultural expression. Earthworks preservationists, researchers, and recent archaeology news feeds called my attention to these constructs enough times to finally prompt online research. I was surprised by their numbers and scale. I quickly noticed many newly-discovered earthworks are already. There seems to be no respect or recognition of the unique archaeological remains. Have efforts been made to protect them? Do the forms go unnoticed on the ground in the jungle because of their large scale? The ancient human landscape has come to the attention of UNESCO, good news for conservationists while jungle deforestation marches apace. Apparently, archaeology survey needs to precede road building in this region, not follow on the deforestation. e de forma tão precisa? Por que? Quando? E com que intenção? que estão sendo realizadas, quais as áreas de pesquisas e como estão sendo feitas. 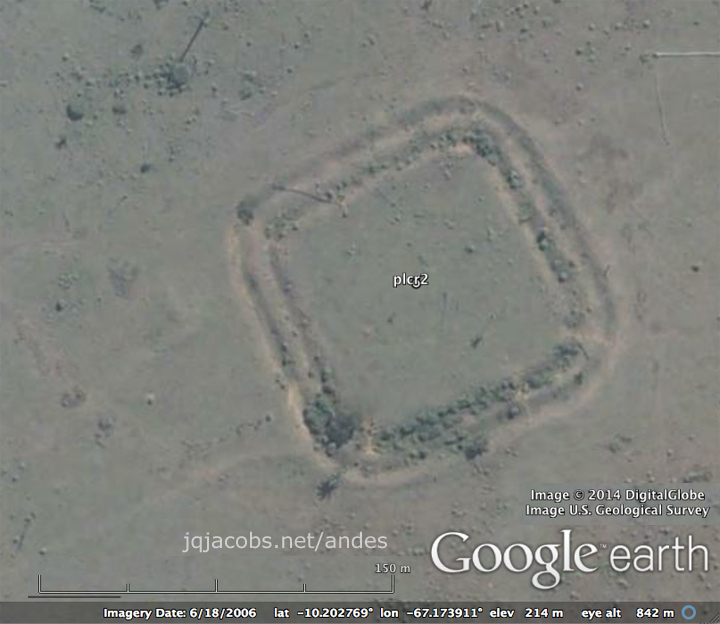 I'm posting a placemark file of the geoglyphs I could find. 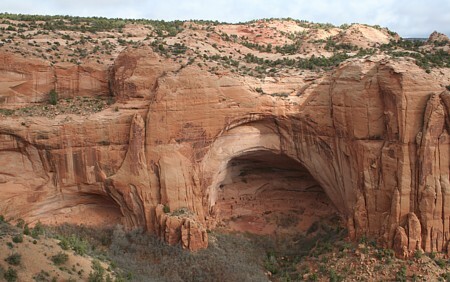 Recently local archaeologists thought, given the known distribution and the amount of the area deforested so far, only ten percent of the geoglifos were known. Some are visible in YouTube videos that are not yet seen on Google Earth. Hundreds exist and more will be visible and discovered as new areas of Google Earth update with hi-res images. 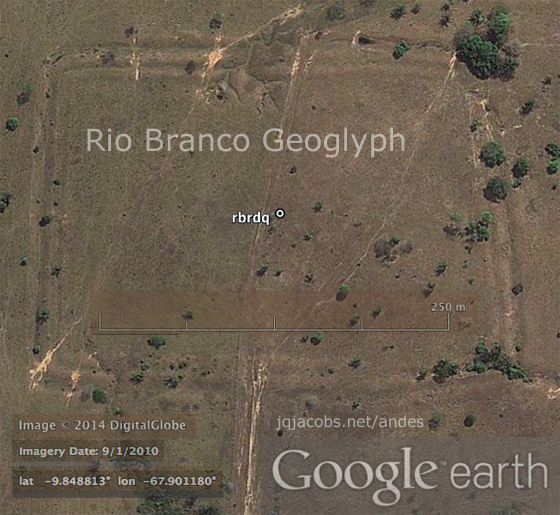 2014.02.02 - Updated Google Earth placemarks file with 240 geoglyphs, plus many ground lines. The new discoveries extend the area of geoglifos east, west, and south, including just across the border in Bolivia. Download brazil_geoglifos.kml. I seek additional placemarks and data files. Please GPS monuments you visit. 2018.11.12 - Globo has an excellent video with their news report With a unanimous decision, geoglifo in Rio Branco is the first to be registered by IPHAN on the UNESCO World Heritage Tentative List. IPHAN's president Kátia Bogéa pointed out "It is something extremely relevant and important about the trajectory of human beings on Earth...."
"... the discovery of Pre-Columbian ditched enclosures in the Tapajós headwaters. The results show that an 1800 km stretch of southern Amazonia was occupied by earth-building cultures...."
... Dependendo dos dados obtidos, eles também podem ser usados para a elaboração de políticas de uso sustentável da floresta. 2015.02.23 - Another major article today, Drones to scan for evidence of ancient civilizations in Amazonia. 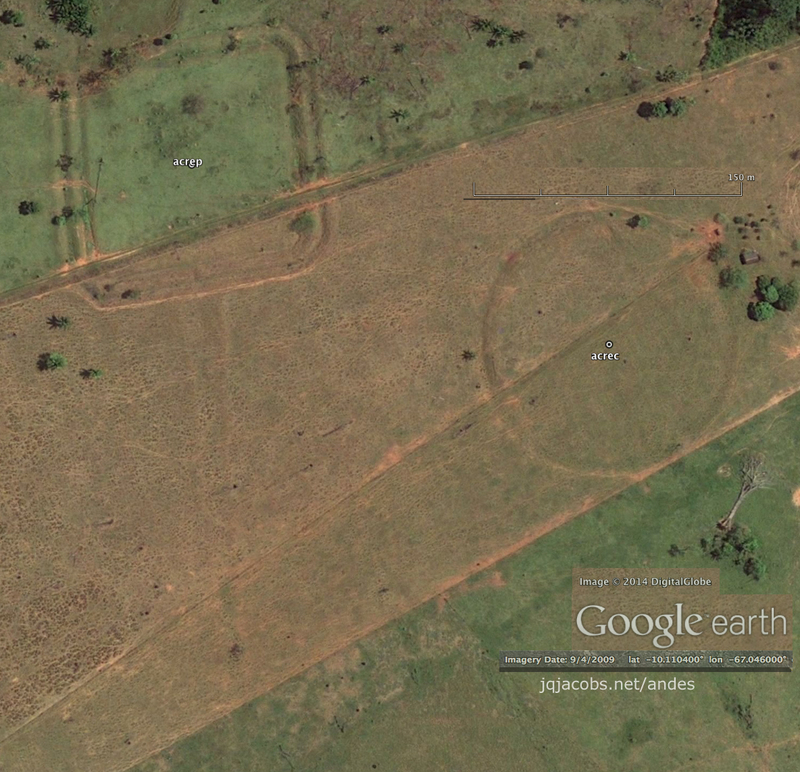 One of the largest works visible in Google Earth is near Rio Branco, Acre, Brazil. Click image for larger version. Images below link to large files with updated, high resolution imagery. percorrem trecho de um geoglifo da Amazônia. 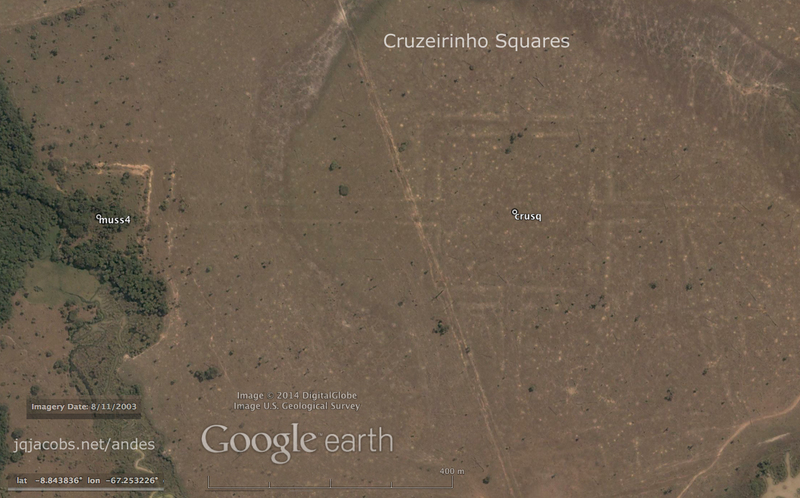 The so-called 'crop circles' of Santa Teresinha are seen in a great photograph. "Satellite images ... have revealed more than 200 geometric earthworks spanning a distance greater than 155 miles (250 kilometers) ... uplands sites appear to have been home to as many as 60,000 people." "It's an ill wind that blows nobody any good. 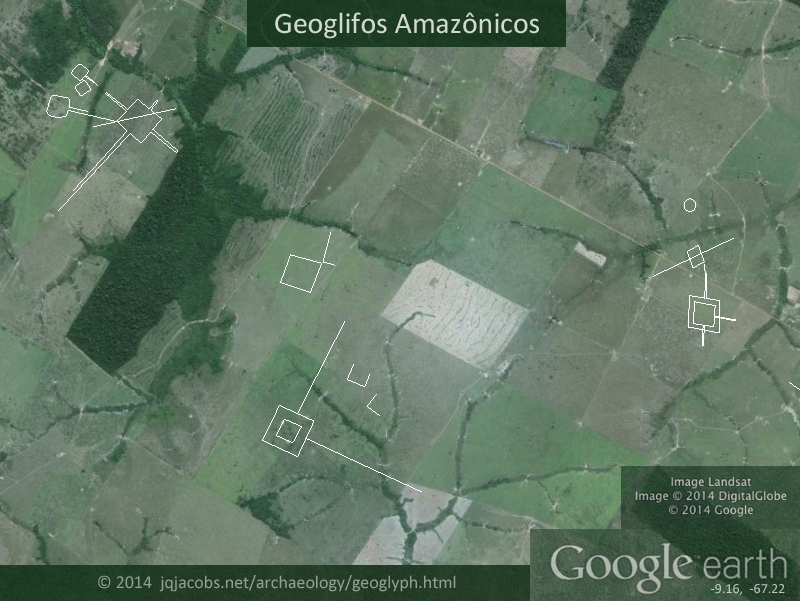 The combination of land cleared of its rainforest for grazing and satellite survey have revealed a sophisticated pre-Columbian monument-building society in the upper Amazon Basin on the east side of the Andes. This hitherto unknown people constructed earthworks of precise geometric plan connected by straight orthogonal roads. Introducing us to this new civilisation, the authors show that the 'geoglyph culture' stretches over a region more than 250km across, and exploits both the floodplains and the uplands. They also suggest that we have so far seen no more than a tenth of it." 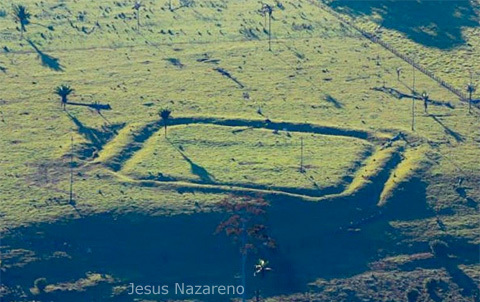 — Pre-Columbian geometric earthworks in the upper Purús: a complex society in western Amazonia Martti Pärssinen, Denise Schaan and Alceu Ranzi, 2009 Antiquity 83(322):1084-1095. "GEOGLIFOS O que são? Geoglifos são vestígios arqueológicos representados por desenhos geométricos (linhas, quadrados, círculos, octógonos, hexágonos etc...), zoomorfos (animais) ou antropomorfos (formas humanas), de grandes dimensões e elaborados sobre o solo, que podem ser totalmente e melhor observados se vistos do alto, em especial, através de sobrevôo." 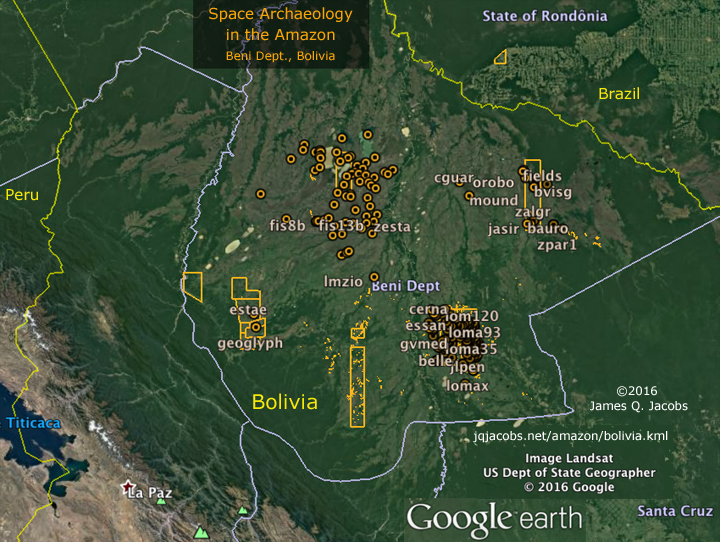 Internet Software Programs Aid in Search for Amazonian Geoglyphs, Alceu Ranzi, Roberto Feres, Foster Brown EOS Vol. 88, No. 21, 22 May 2007. - The Web-based Google Earth software program recently has incorporated high-resolution satellite imagery that facilitates the search for landscape expressions of past civilizations that we call geoglyphs. 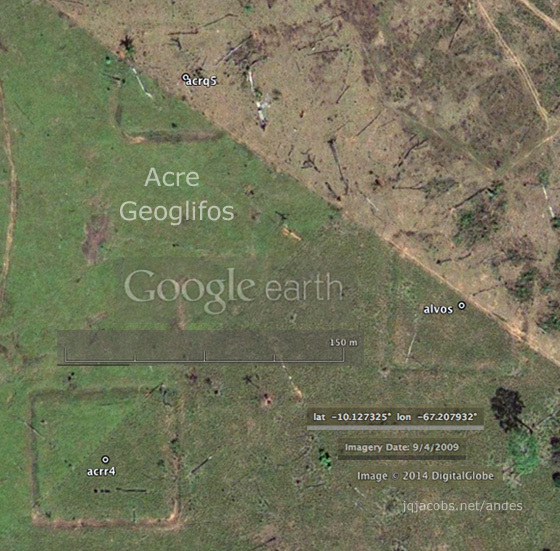 Since 2000, about 40 such geoglyphs have been observed in overflights above recently deforested pastures of southwestern Amazonia in eastern Acre State, Brazil. 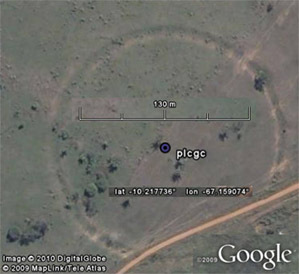 These geoglyphs typically are circular or rectangular, on the scale of 100 meters or more, with bordering trenches 1-3 meters deep (Figure 1). Carbon-14 dating of charcoal associated with these geoglyphs indicates ages between 2500 and 1000 years B.P. "Until the past year, high-resolution Ikonos and QuickBird imagery was too expensive for local researchers to use in surveys for geoglyphs. 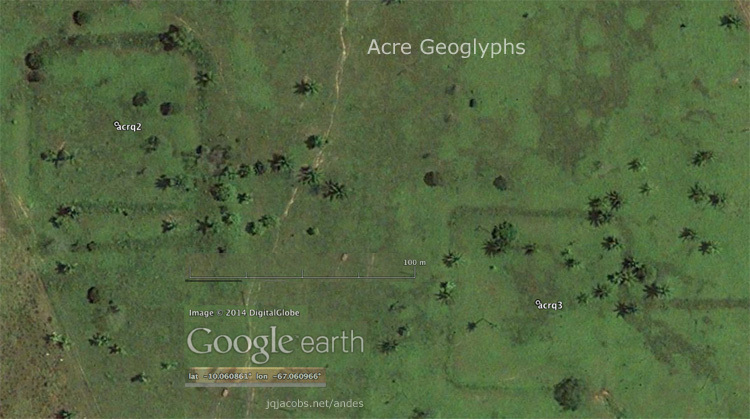 The incorporation of such imagery by Google Earth for extensive stretches in Amazonia has permitted researchers to search for geoglyphs in eastern Acre. Figure 2 shows how preliminary data analysis can be done with high-resolution satellite imagery to determine the areal density and distribution of geoglyphs. 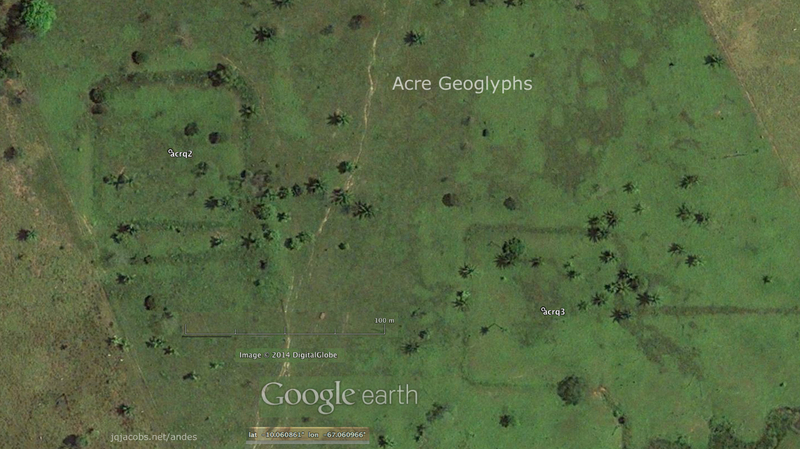 In this transect, 39 potential geoglyphs were observed in an examination of the imagery. Through fieldwork and overflights during the past three decades, only nine geoglyphs had been discovered in the area of the transect." An unusual moment presents itself in the Amazon. Unlike regions where we regret past destruction, this is a region where impending destruction can still be prevented. Will the current physical destruction to the earthworks stop or continue as roads intrude in the jungle and deforestation advances? Will ethnobotanists examine the botanical flora of the clearly-demarcated ancient sites before deforestation? Will any of the still-forested sites be preserved as they are today? 2014.01.28 - Twenty new images of updated Google Earth aerial photography have been added to or linked from this page. Some older images now link to larger, updated imagery. 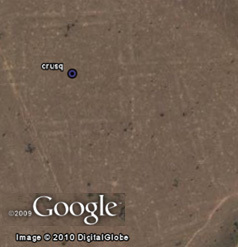 Some of the largest geoglyphs are not yet seen in Google Earth, so check future updates. 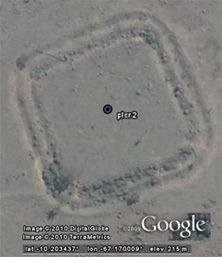 In Google Earth, many geoglyph images updated since 2011, revealing new geoglyphs and providing higher resolution imagery of known geoglyphs. Detailed aerial photographs show how recent the deforestation of some of the earthworks is. They also reveal how fence lines add unwanted new erosion lines to the otherwise still pristine earthworks. Individual trees and even palm fronds are visible in the best resolution updates today, enabling better documentation and oversight of their conservation or destruction. 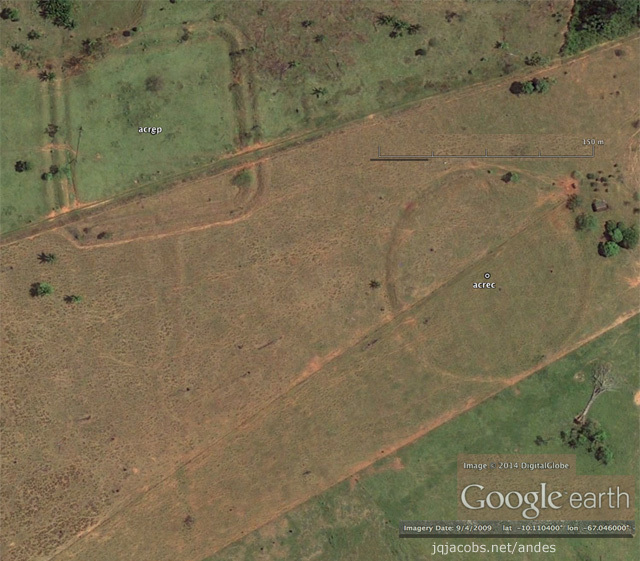 Some newly discovered in Google Earth geoglyphs have been surprising. Geoglifos are now visible much further to both the west in Acre and east in Rondonia. One is seen in Bolivia, making them an international phenomena. A great variety of geometry is presented. Several of the large monuments are grouped. One of the largest of the earthworks, the Bella Flor Geoglyph, measures 380 meters on one axis, surpassing the previous largest. The new database file presents their dimensions and categorizes the geometry. 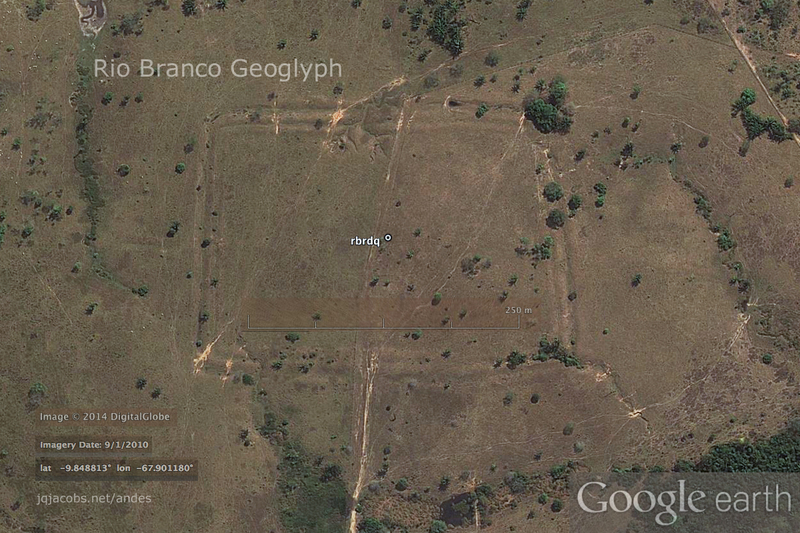 2014.10.08 - Fifty-six new Amazon geoglyphs have been noted where Google Earth images were recently updated, including an area near Boa Vista, Amazonas rich in monuments and lines (image below). To get a better idea of the pattern the images create on the earth, I used the line tool to outline the visible earthworks. New geoglyphs placemarks file: http://www.jqjacobs.net/amazon/geoglyphs.kml, updates to the Excel and KML files with this data to follow. 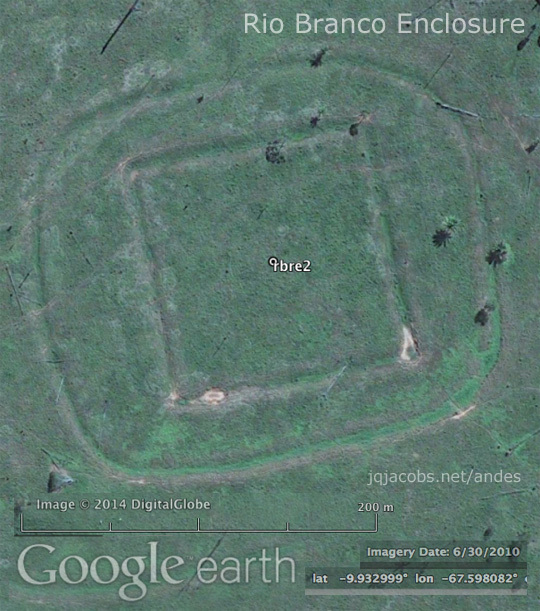 2014.11.16 - Another Google Earth imagery update in Rondonia enabled survey of more geoglyphs. New placemarks, outlines, and lines are added to the most recent files linked above. Coordinates have been updated to uniformly reflect current imagery placements. Some site names and variables in the dataset have been edited. Currently, over 300 geoglyphs are placemarked. Google Earth Community will be adding these placemarks online with the next update. If you see two of each placemark after opening the placemark file, you can hide the online ones by turning off Layers > Gallery > Google Earth Community in your virtual browser. 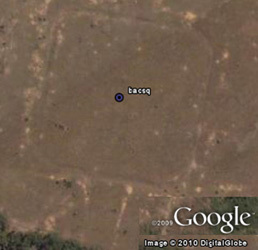 Google Earth's Historical Imagery tool is quite useful in surveying the sites. The slider facilitates switching between all the different aerial images that have been posted for every location. In some cases, older views are not deforested or overgrown and uniformly green. Other images may reveal the earthworks clearly because the pastures are closely grazed during the dry season when vegetation colors vary. Switching between images also reveals how much placement has changed as newer images were added, illustrating why some coordinates have been updated. Historical imagery also reveals earthwork destruction. I noticed bulldozing obliterating earthwork acrc16 (-10.0968 -67.6587) just before Sept. 2009, for the convenience of planting it seems. Plowing is impacting others. Bulldozing is used in deforestation, so many earthworks may disappear before images of them are even captured. As is typical of the "advance" of "civilization," we know not what we destroy and the destruction impedes ever knowing. Pages are being torn from the book of history written upon the earth. The earthworks are protected by laws, which apparently are either ignored or not enforced. The virtual resources to appreciate this incredible cultural manifestation aid in preservartion efforts. As more and more geoglyphs become clearly visible in Google Earth, the immense and impressive scope of the Amazon geoglyphs becomes more apparent. We have a long way to go to understand what we are discovering. 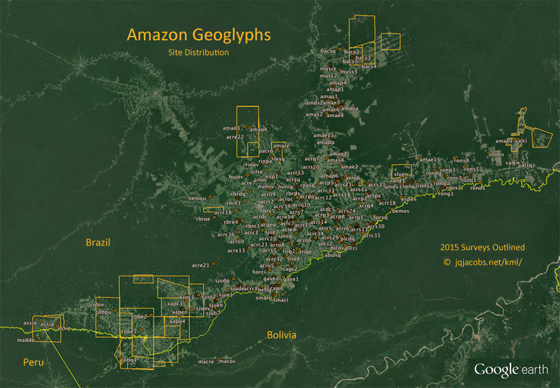 Hopefully, the Amazon geoglyphs will be one manifestation of the past that survives the present, or we may never know. 2016.02.16 - With all 2015 and 2016 surveys to date and data consolidation, the data files now include 440 geoglyphs. Excel and Google Earth files are updated, and archaeogeodesy.xls has all 2015 data. 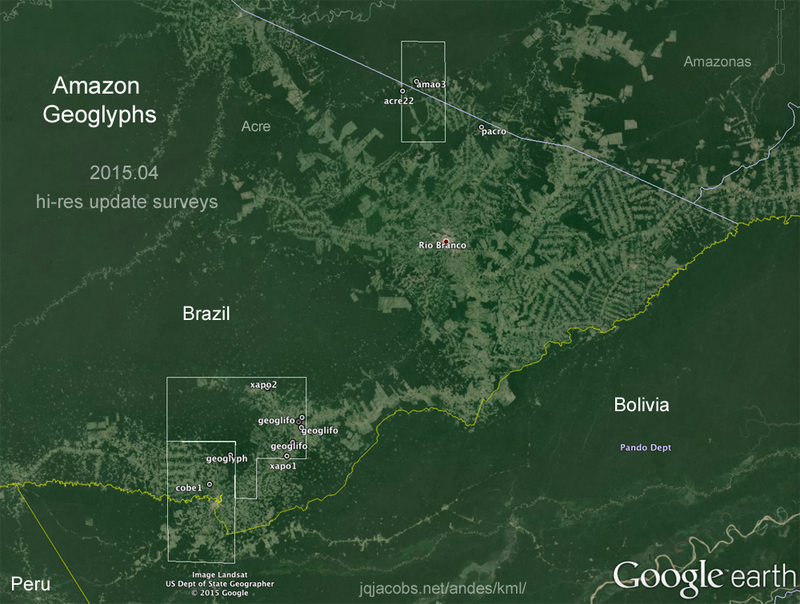 After discovering the first geoglyph in Peru and several more in Bolivia, I renamed the files Amazon Geoglyphs. 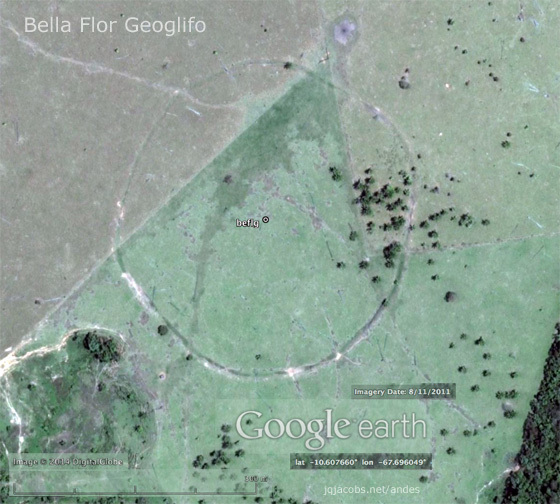 Included for comparison are several large geoglyphs in Beni, Bolivia. Also, compare the Kazakhstan geoglyphs. Space archaeology has become easier over the last decade as more high resolution imagery is published. I can't keep up, but I'll keep trying. Already, more areas in Bolivia are updated and many more earthworks are visible, so I'll update this file later. Check the ArchaeoBlog for the latest news. Meanwhile, in the bolivia.kml zero in on the immense zanjas in southeast Mojos and their lunar major alignment. Recent research references, unsorted, from above KML file, lead to the researchers working in the region. The linked articles provide further bibliographies. 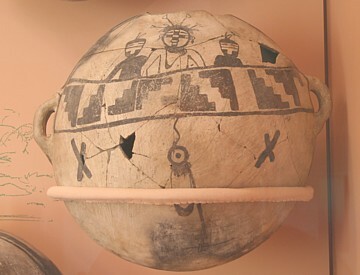 Walker, John H. 2008 "Llanos de Mojos;' in William Isbell and Helaine Silverman, eds., South American Archaeology. New York: Kluwer, 927-940. Denevan, William M. 1966 The Aboriginal Cultural Geography of the Llanos de Mojos of Bolivia. Ibero-Americana 48. Berkeley: University of California Press. Denevan, William M. 1992 "The Pristine Myth: The Landscape of the Americas in 1492:' Annals of the Association of American Geographers 82(3): 369-385. Denevan, William M. 2001 Cultivated Landscapes of Native Amazonia and the Andes. Oxford: Oxford University Press. Raised Fields in the Bolivian Amazonia: a prehistoric green revolution or a Floodrisk mitigation strategy? Nordenskiold, Erland 1913 "U rnengraber und Mounds im Bolivianischen FlacWande;' BaesslerArchiv 3: 205-255. You can visually explore the earthworks, the deforestation, and expanses of forested jungle on the virtual globe. Visit http://earth.google.com for more information about Google Earth. Visit Google Earth Community to keep apace with imagery updates. I will add content below as news, publications, and good photography links develop. Abril 10, 2009 Geoglifos do Acre podem ser reconhecidos pela Unesco como Patrimônio da Humanidade no Brasil. "Os geoglifos do Acre foram incluídos pelo Instituto do Patrimônio Histórico e Artístico Nacional (IPHAN) numa lista indicativa de bens passíveis de ser declarados pela Unesco como Patrimônio da Humanidade no Brasil." "18/04/04 - Expertos de Brasil, Italia y Finlandia estudiarán en la selva amazónica unos enigmáticos "geoglifos", enormes dibujos ... obra de una antigua civilización desaparecida. Los trazados geométricos en bajo relieve, de hasta 350 metros de largo y hasta tres metros de profundidad, fueron excavados hace cientos de años ... cerca de las fronteras con Bolivia y Perú ... Los cuadrados, círculos, hexágonos, círculos con cuadrados dentro y cuadrados que contienen círculos, pudieron haber sido hechos por indios que vivieron en la región entre 800 y 2.500 años atrás, de acuerdo al Departamento de Patrimonio Histórico y Cultural de Acre. Amazon explorers uncover signs of a real El Dorado by Rory Carroll, "It is the legend that drew legions of explorers and adventurers to their deaths: an ancient empire of citadels and treasure hidden deep in the Amazon jungle." ... "... only now, as satellite imagery and felling reveal sites ... the scale of the settlements is becoming clear. Some anthropologists say the feat, requiring sophisticated engineering, canals and roads, rivals Egypt's pyramids." www.geoglifos.com.br/ - criado pelo paleontólogo Alceu Ranzi - fotos e informações podem ser obtidas - Geoglifos do Acre. 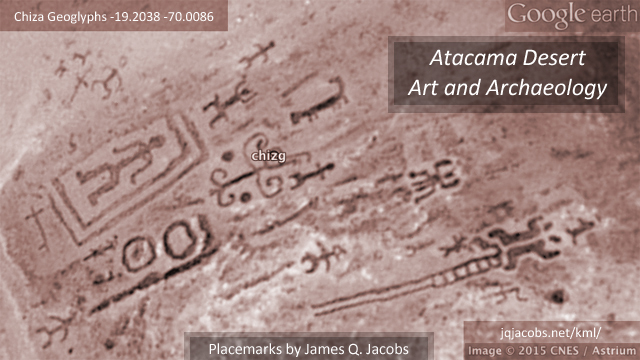 More information and photos on the Geoglyphs of Acre site. Hay mas informacion y fotos en el sitio Geoglifos de Acre. Fotos/photos. Lombardo, Umberto and Heiko Prümers 2010 Pre-Columbian human occupation patterns in the eastern plains of the Llanos de Moxos, Bolivian Amazonia, Journal of Archaeological Science 37:1875-1885. "The forested western Amazon was once thought barren of complex human culture. But researchers are now uncovering enigmatic earthworks left by large, organized societies that once lived and farmed here." Ancient Earthmovers Of the Amazon C. C. Mann 2008. "The unexpected discovery of immense geometrically patterned earthworks called "geogphyhs" among the terra firme rainforests of western Amazonia is radically changing our notion of past human societies in this region of the Amazon. 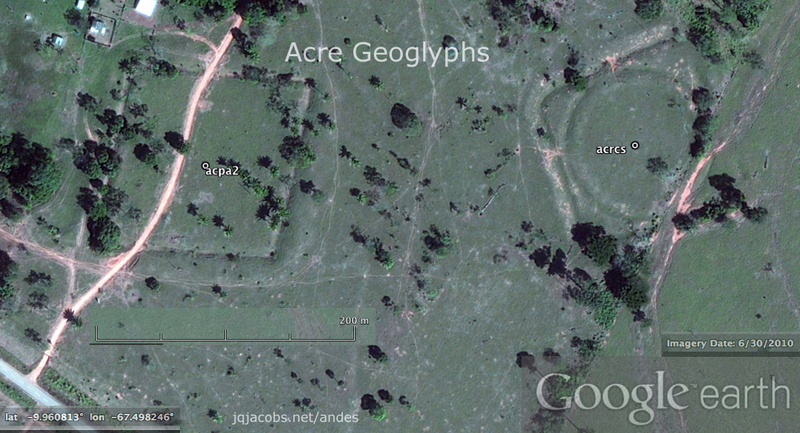 Over 300 of these spectacular geometric earthworks have been found across eastern Acre state, Brazil." The Geoglyphs site has a photo gallery. Denise P Schaan 2011. The legendary El Dorado—the city of gold—remains a mere legend, but astonishing new discoveries are revealing a major civilization in ancient Amazonia that was more complex than anyone previously dreamed. Scholars have long insisted that the Amazonian ecosystem placed severe limits on the size and complexity of its ancient cultures, but leading researcher Denise Schaan reverses that view, synthesizing exciting new evidence of large-scale land and resource management to tell a new history of indigenous Amazonia. Schaan also engages fundamental debates about the development of social complexity and the importance of ancient Amazonia from a global perspective. This innovative, interdisciplinary book is a major contribution to the study of human-environment relations, social complexity, and past and present indigenous societies. "... you found many we still didn´t have. We have identified 410 geogliphs in Acre alone." Denise Schaan (e-mail) 2014.02. Good aerial photography with place names: Tecnologia faz descoberta de geoglifos na Amazônia saltar 1.000% em 11 anos 13/10/2012 Em junho deste ano, pesquisadores identificaram 18 novas formas geométricas no Amazonas, antes escondidas pela floresta. "RIO BRANCO - Descobertos no Acre, os geoglifos ganharam repercussão nacional e internacional em 1977. Em entrevista ao portalamazonia.com, a atual responsável pelos estudos, pesquisadora Joanna Troufflard, conta que a identificação de novas formas geométricas na Amazônia se intensificou a partir de 2005, por meio de imagens de satélite. Até 2001, eram conhecidos apenas 24. O número saltou para 120 em 2005, e hoje são cerca de 300 somente no Acre. ..."
Long Before Making Enigmatic Earthworks, People Reshaped Brazil’s Rain Forest reports on Jenny Watling recent research and has two great aerial images. Good science writing by Joanna Klein for the New York Times. 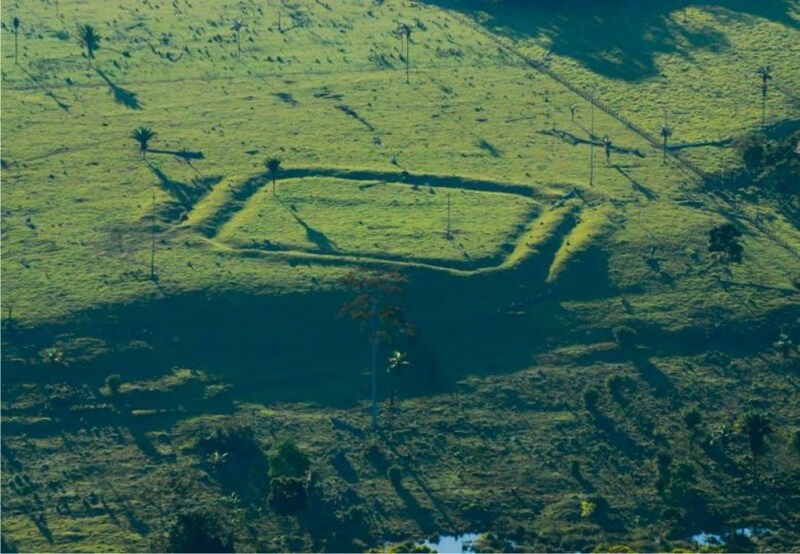 Covering Watling's research, Charlie Wood writes, "Mysterious earthworks in Western Brazil known as 'geoglyphs' might hold historical lessons about sustainable management of the Amazon, and forests in general." 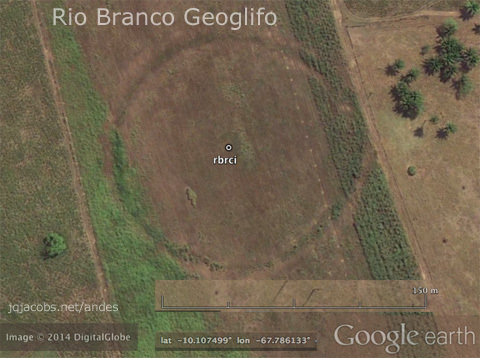 Do these ancient 'geoglyphs' hold a secret to preserving the Amazon? © 2019 by James Q. Jacobs. All Rights Reserved.